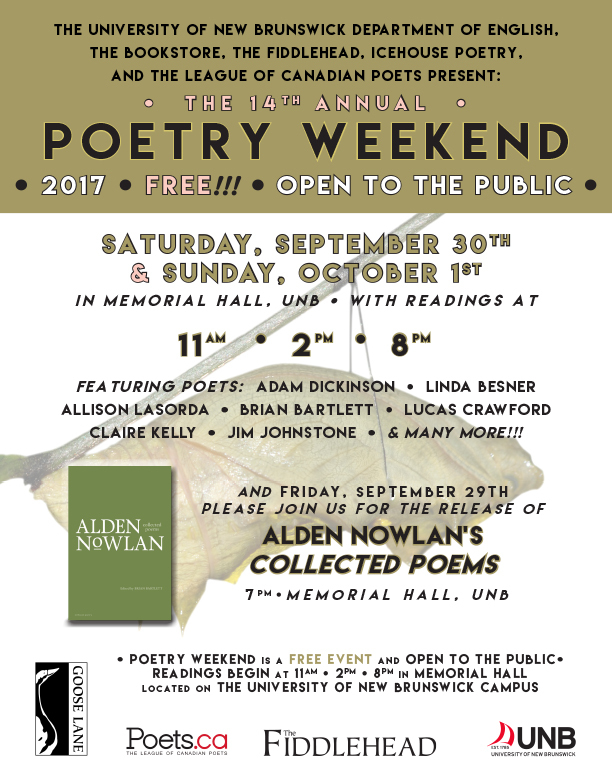 14th Annual Poetry Weekend (+ Launch of Collected Poems of Alden Nowlan) Takes Place This Weekend! The University of New Brunswick invites you to our 14th annual Poetry Weekend, a celebration of Canadian poetry featuring new and seasoned poets alike! Join us on Saturday, September 30th and Sunday, October 1st at UNB Fredericton’s Memorial Hall for a series of readings by Canadian poets. Featured guests for this year’s festivities include: Adam Dickinson, Linda Besner, Allison LaSorda, Brian Bartlett, Lucas Crawford, Claire Kelly, Jim Johnstone, and many more! Readings take place at 11am, 2pm, and 8pm on both days. 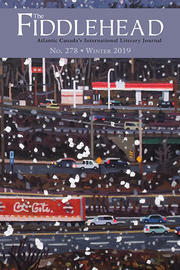 As an added bonus, please join us on Friday, September 29th at 7 pm in Memorial Hall to celebrate the release of Alden Nowlan’s Collected Poems with Goose Lane Editions. The evening will feature several national and local writers reading poetry by this beloved poet, and copies of Nowlan’s much-anticipated collection will be available for purchase. Alden Nowlan (1933-1983) wrote of a desire to leave behind “one poem, one story / that will tell what it was like / to be alive.” He fulfilled this desire beautifully in poems characterized by evocative imagery, structural versatility, a wide vocal range, and a profoundly moving mix of directness, playfulness, compassion, and vulnerability. Over three decades after his death, the publication of Collected Poems of Alden Nowlan is a major, welcome event in Canadian literature. Authors scheduled to read from the collection at this special event include Brian Bartlett, Colleen Kitts-Goguen, Sue Sinclair, Mark Bartlett, Lynn Davies, David Adams Richards, David Seymour, John Wall Barger, Ian LeTourneau, Diane Reid, Thomas Hodd, Aly Fleming, Martin Ainsley, Jenna Albert, Jim Johnstone, Jenn Carson, Roy Adams, Triny Finlay, Raymond Fraser, Ross Leckie, Michael Pacey, Jill Watson, Nancy Bauer, Laurence Hutchman, M. Travis Lane, and Allan Cooper. Through the magic of recording, guests will also be treated to a reading from Alden Nowlan himself! Poetry Weekend is presented by the League of Canadian Poets, The UNB Department of English, the UNB Bookstore, The Fiddlehead, Icehouse Poetry, and Goose Lane Editions. Admission to Poetry Weekend is free and all are welcome to attend. We look forward to having you join us at one of our most anticipated events of the year! Would do love to be there. Can't wait to see Alden Nowlan's Collected Works. Long overdue. Sounds wonderful! You might want to check your dates though. Saturday is the 30th. Thank you for letting us know about the typo on the date! It's been corrected.